12/10/2009Share this story on Facebook! 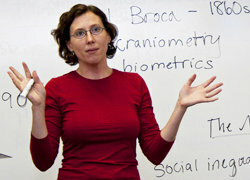 What does new CSCRE assistant professor Miranda Hallett think of IC so far? “I’m enjoying the enthusiasm of the student body,” says Hallett, who earned her Ph.D. in cultural anthropology at Cornell University. She also appreciates the small size of her classes, which include Introduction to Latino/a Studies, Introduction to Whiteness Studies, and Nation, Migration, Citizenship. He constructs his classes based on that philosophy, walking into classrooms as a coparticipant in the learning process. “I don’t teach what I know; I teach what I want to learn,” he says. 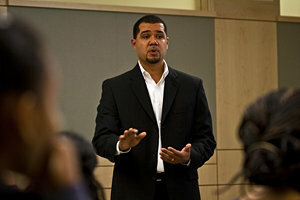 After earning his undergraduate degree in political science and a master’s degree in education from the University of Rochester and a Ph.D. in policy, analysis, and management at Cornell University, Eversley Bradwell began working at Ithaca College in 2001 in the Center for Teacher Education. In 2005 he moved to CSCRE, where he currently teaches classes such as Critical Race Theories in the United States and Hip-Hop Cultures. In his classroom, he puts as much responsibility and ownership on students as possible. Instead of lecturing, he facilitates conversation to get students thinking in different ways. Natalie King ’12, who took Eversley Bradwell’s Introduction to African Diaspora Studies last year, says he may be the most challenging professor she’s ever had. Eversley Bradwell uses a variety of media in his classes—books, film, audio, the Internet—and though he may teach a course with the same title semester after semester, he always changes the material to keep the learning process going. “Otherwise knowledge gets stale,” he says. Active both at the College and in the community, Eversley Bradwell serves on the President’s Advisory Committee for Diversity, as faculty-in-residence for the MLK Scholar Program, and on the Ithaca City School Board. 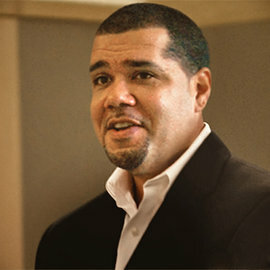 He is also a member of several academic services on campus and a frequent keynote speaker and lecturer. Eager to encourage dialogue, Eversley Bradwell wants to get students to start thinking differently and talking about those differences in order to discover more about themselves and others.